Kate White once asked her daughter to stalk her through the woods so she could better understand the feeling of being followed. While not the most orthodox way to get into the writing zone, it’s one of the many ways this New York Times bestselling author tackles the research required to write her mystery and psychological suspense novels. Up until a few years ago, much of that research was organic. The protagonists in White’s novels are often entrenched in the sometimes not-so-glamorous world of the beauty and fashion industry—something White knows a lot about as the former Editor-in-Chief of Cosmopolitan, the number one monthly magazine on the newsstand at the time of her tenure. True—but White makes it seem effortless. 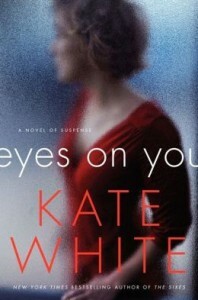 EYES ON YOU, White’s third stand-alone psychological thriller, due out this month, marks her ninth published novel. Like the bulk of her books, EYES ON YOU is a great Who-Dunnit about Robin Trainer, a second-chance media star who must battle a malevolent enemy who won’t stop until Robin loses everything—maybe even her life. This is the first book in which the mystery directly involves the protagonist’s work—but White is confident the story is relatable for many women, including herself. Peppered with numerous red herrings, and written with the same “easy breezy” style for which White’s novels are famous, White is especially proud of EYES ON YOU, partially because she had more time to write (and market) it after leaving her Cosmopolitan post of fourteen years. In fact, White’s love of writing started at an early age. She often created newspapers and magazines as a child, and as with many mystery writers, became obsessed with Nancy Drew books and the idea of writing about crime. Nancy’s mysteries affected White so profoundly she actually considered a career as a private investigator, investing in a raincoat and a water pistol. But she realized quickly she didn’t have the stomach for the job, and opted to write about the genre instead, modeling her cliffhanger endings a bit after Carolyn Keene’s. This is the case with each of White’s stories, including the books in her mystery series featuring tabloid writer Bailey Weggins, giving each novel a somewhat lighter feel than many of the books written by White’s idols. White’s fans aren’t complaining. Not only have her books appealed to a tremendous fan base, giving her bestselling status and the ability to pen more stories, but her novels have been previously optioned by Lionsgate, ABC, and most recently, by a production company looking to turn IF LOOKS COULD KILL into an opera. Not to mention the marketing and branding, which often includes a heavy social media presence. White is active on Facebook and Twitter, providing her fan base with insight into both her professional and personal life. 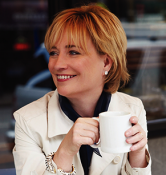 In addition to writing mysteries and psychological thrillers, White is a touring speaker, and the author of several non-fiction career books. While her schedule is easier to manage since she left Cosmopolitan and her kids are full grown, White still leans on her time management skills to balance her hectic writing world. Though, she advises beginning authors to do as she says, rather than follow her lead. To read more about White, her novels and her upcoming release, EYES ON YOU, follow her on Twitter and Facebook, or check out her comprehensive website (including a regularly updated blog) . 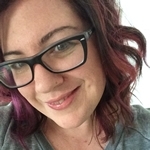 Kate White, the former editor in chief of Cosmopolitan magazine, is the New York Times bestselling author of six Bailey Weggins mysteries and two stand-alone novels of suspense: HUSH and THE SIXES. She lives in New York City.